A rare triple celestial event will happen on on Friday, March 20, 2015. That's because a total solar eclipse and Super Moon occur during the 2015 Spring Equinox (also known as the Vernal Equinox). 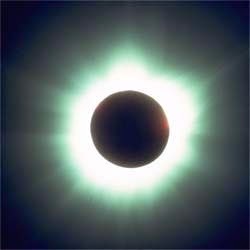 The total solar eclipse occurs at 9:43 a.m. UTC but will only be viewable from the Faroe Islands, located northwest of Scotland, and the Svalbard Islands, located east of Greenland. Around the same time, a partial solar eclipse will be visible in surrounding regions of Europe, northern Africa and northern Asia. However, the eclipse will not be visible from anywhere in the U.S.
A solar eclipse can only occur during a New Moon. But this isn't any ordinary New Moon - it is considered a Super Moon because the New Moon will be much closer to the Earth than usual during its perigee. A solar eclipse occurs when the moon passes between Earth and the sun, casting a shadow over Earth. The moon’s shadow masks the solar surface and blocks sunlight from reaching Earth directly – but the amount of sunlight blocked depends on location. For example, on March 20, those in Glasgow, Scotland, will see about 94-percent of the sun blocked by the moon. The unblocked sunlight will appear as a thumbnail sliver. In Paris, the moon will block about three-quarters of the sun at the time of maximum eclipse. According to the U.S. Naval Observatory, the Vernal Equinox, marking the changing of the astronomical Seasons from the last day of Winter to the first day of Spring, occurs on March 20th at 6:45 p.m. Eastern Daylight Time (22:45) UTC. 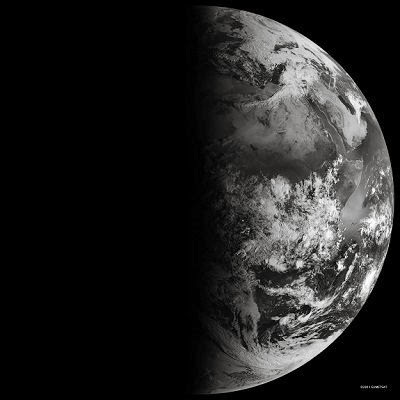 As pictured in this NASA Earth Observatory photo, the Spring Equinox is caused by the tilt of the earth's rotating axis. Equinox means "equal night" in Latin, capturing the idea that daytime and nighttime are equal lengths everywhere on the planet. That is true of the Sun's presence above the horizon, though it does not account for twilight, when the Sun's rays extend from beyond the horizon to illuminate our gas-filled atmosphere. It is the equal amount of day and night in the northern hemisphere for locations like Melbourne, Florida, but also in the southern hemisphere for locations like Melbourne, Australia. The apparent change in location of the sun and moon, marks important dates for hunting, fishing, and farming. Of course, it is not the Sun that is moving north or south through the seasons, but a change in the orientation and angles between the Earth and its nearest star. The axis of the Earth is tilted 23.5 degrees relative to the Sun and the ecliptic plane. The axis is tilted away from the Sun at the December solstice and toward the Sun at the June solstice, spreading more and less light on each hemisphere. At the equinoxes, the tilt is at a right angle to the Sun and the light is spread evenly. How can it be Spring if it is still snowing in parts of the United States? Blame the oceans, which heat up and cool down only slowly. By March 20 they are still cool from the winter time, and that delays the peak heat by about a month and a half. Similarly, on the first day of Fall in September, the ocean water still holds warmth from the Summer, and the hottest days are still (on the average--not always! ) a month and a half ahead.